Just flew back in yesterday from this weekend’s “Now Revolution Conference” in Columbus, Ohio, where it was my honor to have the opportunity meet with quite a few entrepreneurs, business owners, and future business owners to talk about marketing in the 21st Century. My wife and I met Gary and Drenda Keesee last year when they were in town for the Sarasota Financial Revolution Conference. Since that time, they’ve completely revamped the conference, giving it a new name and a new focus. They’ve also completed construction on “The Now Center” in New Albany, Ohio — just outside of Columbus. This past weekend, they hosted the first major conference in that facility and it was absolutely stellar. Gary’s message is targeted at helping individuals discover and pursue their God-given destiny and to unashamedly achieve financial freedom in the process. These are issues that I’m personally very passionate about, which is the reason that we created our Christian entrepreneurship and business excellence events. Drenda Keesee — powerhouse in her on right, having journeyed with, encouraged and motivated Gary in their journey from enslavement to financial freedom. Arguably some of the biggest testaments to her own giftings are their children, whom she home-schooled and developed into some significant young people. After briefly meeting their daughter, Amy, and son, Tom, I can tell you first-hand that they and their siblings are showing signs of greatness. Johnny Hocott — a key player in the Forward Financial Group who I met several months ago when he spent some time here in Sarasota. Johnny is focused on developing and training new leaders and I’ve seen firsthand some of the fruit of his labors in some of the people here in our city. Mike Healy — a dynamic and compelling motivator and trainer who is clearly out to win! Mike enjoys cagefighting, which I must confess is something I don’t much about… but it sounds, shall we say… violent? Mike and his wife went from getting eviction notices to a 6-figure income in a 12-month time span and has plenty of important things to share with anyone looking to achieve success. I couldn’t say enough good things about the event staff, from Jason Freudiger and Amy Taylor to the media staff all the way through to the volunteers. The event ran smoothly despite the inevitable last-minute changes and adjustments. Everyone made the experience a pleasant one. If you’re one of the many people I met this past weekend, I have something for you. Leave a quick comment here and let me know who you are so I can e-mail it to you. Also, if you missed the chance to take advantage of the conference specials, I’ll give you a way to do that. There’s no short, simple answer to this question. And about a year ago, I sat down and tried to figure out the best way to help show our clients, colleagues and friends with small businesses how to put all of this into practice. What resulted was a 12-week marketing training program that we implemented for the first time early this year. Before getting into more detail, I want to mention that we’re taking the major highlights of this process and presenting them in Sarasota in a half-day seminar on September 27th. Visit Results Now Marketing to find out all about it. The results have been nothing short of mind-boggling. Instead of us actually providing services to these businesspeople, we’re simply showing them the process we use. It’s a strategic process, which means that it is transferable and can be adapted to just about any business. One company put the techniques to work for them and, after having a website for 7 years that never made it anywhere near the top of the search engines, they put a brand new website on the front page of Google (for actual searches that their potential customers would run) in just a matter of a couple of weeks! That’s just the beginning… some of the strategies we show have multiplied the revenues in some of our clients within a matter of a few months. I want to show you how as well. Join us on September 27th for Results Now Marketing in Sarasota. Syesha Coming Home to Sarasota… But Just for a Visit! After this week’s emotional round on American Idol, it’s official, Syesha is in the AI Season 7 Top 3!! Congratulations, Syesha!! We’ve already posted our support for this hometown Sarasota girl, but the exciting news this week is that local residents will have a chance to see Syesha tomorrow (Friday, May 9th) when she blazes through on a whirlwind visit to the Gulf Coast of Florida. Evidently, she’ll be making some stops in the morning on Tampa TV & Radio, but she visits Bradenton (where she’ll receive a key to the city) and then comes to Sarasota for a concert on the gorgeous grounds of the John & Mable Ringling Museum! According to the Sarasota Convention & Visitors Bureau, the concert is FREE and open to the public! Park nearby on the New College Campus. I’d get there early (parking is available at 1pm) for the 3:30PM concert. It’ll most likely be brief, as she’s got to get back to Hollywood! If previous seasons are any indication, we should see footage of Syesha’s Homecoming Visit on next week’s American Idol! *Update (May, 2011): Unfortunately, the downloads we originally linked to are no longer available as The Kingdom Alliance website (see below) has been taken down. We have located this downloadable product (link fixed, January 2014) available for purchase directly from Gary Keesee’s ministry that can serve as an update to / replacement for the materials we originally recommended here. This week’s Financial Revolution Conference in Sarasota got underway last night with a powerful kickoff meeting. Gary and Drenda Keesee shared the emotional story about how they turned the tide on their drastic financial situation — credit cards, finance company loans, IRS debt, medical bills, personal loans from family, mortgages, etc. — and began creating wealth instead. Gary pointed out that the “switch” for this about face was in their hearts. 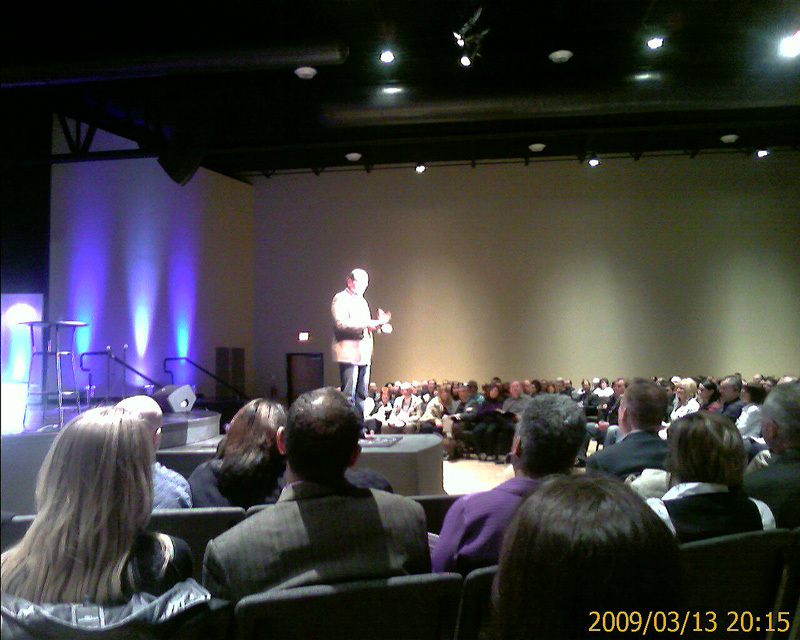 The Kingdom Alliance has posted the audio from Gary’s talk (*Update: 5/11/2011, the Kingdom Alliance website is unfortunately no longer available) last night for all to hear at no cost. It is definitely worth the time to listen to it. Those who came to the event last night expecting to hear a talk on better money management, budgets and numbers were surprised at what Gary had to say. Not only did he address the issues of the heart, but he also dealt with what he characterizes as misconceptions that have been perpetuated by church teachings regarding money. Based upon the content of last night’s talk, the remainder of the conference promises to be significant. The conference continues with meetings tonight (Friday) at 7pm and Saturday at 9am. The meetings are being held at the facility belonging to the First Church of the Nazarene, 3375 Fruitville Road in Sarasota. If you’re not familiar with who they are, The Kingdom Alliance is a group of 5 congregations who have joined forces to increase their impact on the communities of Sarasota & Bradenton. This type of cooperation among church leadership is quite rare in a landscape filled with competition over what some experts would describe as a dwindling pool of potential congregants. This is the first community event that they have publicized, and it’s a good taste of things to come! As most of our faithful readers know, this company was founded as a marketing consultancy. Marketing strategy is and always been our core competency. And, although we’ve done quite a bit of strategic work over the years that has been focused more at leadership and overall performance, in the last 24 months or so, we’ve been doing more strategic marketing work than ever before. “When David told me that I could start using the internet as a primary method for marketing my Neurology practice and obtaining new patients, I didn’t believe him. I did not understand the power of the Internet in reaching thousands of people daily with information about my business and services we provide. However, having prior experience of working with Dave, where he made outrageous claims that I didn’t believe, I proceeded with designing a completely new website and blog site. – V. Daniel Kassicieh, D.O., founder of Sarasota Neurology, P.A. One client (with a well-established business) multiplied revenues by a factor of 5 just last year alone! We’re having such tremendous results that we recognize the need to share what we know. The good news is that any business person can implement these strategies right away. So… I have 2 critical announcements to make. Effective January 1, 2008, we have no longer been offering any consulting services not related to marketing. The epiphanyconsulting.net site will be redesigned (when we have time) to reflect that change. We are formally announcing that we are not accepting new Epiphany Marketing clients at this time. The EpiphanyMarketing.com site has already been changed to reflect this fact. We will continue to evaluate new strategic marketing projects only from existing clients and Epiphany Marketing subscribers on a first-come, first-served basis. This means that the best way to access what we know is to participate in one of our training programs. A new round of these is starting up shortly. Consider this your personal invitation to join me and my good friend (and client) Michael Pink on a conference call this Thursday or Friday. There are currently 4 time slots to choose from, but a couple of them are already nearly full (we can only accommodate 200 callers on each call), because Michael has been inviting people through his blog. We will consider adding additional slots if these fill up completely. Here’s where to go sign up for these important calls. I look forward to talking with you very soon! China. India. The increasing decline of the dollar. A globally integrated economy like never before in the history of the earth. These are some of the signs of the kind of large-scale sweeping change that is not only coming… but is here today. Evidence of this includes the recent trillion-dollar single-day losses on global equity markets due to the fraudulent trading activity of one 31-year-old French futures trader. Thankfully, it was Martin Luther King Day here in the U.S., and our equity markets were closed. The Federal Reserve jumped in with the largest emergency rate cut in 26 years, and followed it up with another large cut at its regular meeting the following week. What does all of this mean to business leaders — particularly small-business entrepreneurs? How do we navigate the unfamiliar waters we now find ourselves in? All of these topics and more are the subject of an event taking place at the end of this month called, “Winning in the New Economy.” The list of speakers reads like a virtual roster of Epiphany Consulting business partners and clients. Included in the lineup are Eric Beck, founder of the Total Integration Program, my good friend Jeff Timpanaro of Oberata Consulting in Houston, Blain Wease of Provincial Development in Nashville, TN, and Juan and Sharon Restrepo of REIPtheRewards.com and Home Rescue Solutions here in Florida. The event is being held at the exclusive Pelican Preserve in Fort Myers, Florida and will be a mixture of keynote-style sessions and workshop-style sessions. You should expect to finish the day with a working strategy in hand, well-equipped to chart out a course for the future even through the murky waters of change. All the details, including online registration, are available at the event website. By the way, if you’re interested in hearing more about it, Eric Beck was my special guest co-host today on the Friday Wrapup Podcast. We talked quite a bit about the transitions we’re all facing and the identity crisis it seems to have created on multiple levels. Hear the “Identity Crisis” episode here.